Five remarkable audio tours bring you a new and unique perspective on the lives of the people who lived and worked in the grand mansions of the Gilded Age in Newport. Explore The Breakers, Marble House, The Elms and Rosecliff at your own pace with our state-of-the-art digital audio players. Now, you can also choose to download our new mobile app from your app store, and listen on your own smart device! Save time by downloading the app even before you arrive, and choose the tour you would like to take. 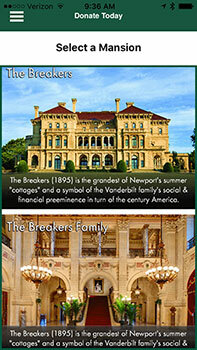 Just go to your app store, and search for "Newport Mansions" identified with the green pineapple icon. Based on personal diaries, letters, records and oral histories, the audio tours offer the personal stories of the men and women who lived in each house and the household staff who cared for them. At The Breakers, choose from the main audio tour or a Family Tour, which piques the imagination of youngsters and their parents with a tour narrated by The Breakers itself, and a number of fanciful characters. Listen to first-person accounts of life in the house from members of the family, servants and their children, including stories that have never been heard before. The tour also takes visitors through several servant spaces. The Family Tour brings the house, its furnishings and even its sculpture to life, allowing youngsters (and their parents) to see the house through a new set of eyes. At Marble House, hear Alva Vanderbilt talk about the architectural masterpiece she helped to design, which she described as "…like a fourth child to me." Learn how she used it to cement her place in society, to arrange her daughter's marriage to British aristocracy, and later as a rallying point for women's right to vote. At The Elms, you'll hear fascinating first-person accounts of life in a house modeled after an 18th century chateau, built for entertaining and as a showcase for art, but with every modern convenience available at the turn of the 20th century. The Elms tour also provides new information about recent restoration projects in the house and about servant life. An audio tour at Rosecliff will take you through the colorful history of society hostess Tessie Oelrichs, who built the house as a center for grand entertainment, up through its last private owners, the Monroe family of New Orleans, who donated the house to the Preservation Society. You'll also hear details about the current exhibition in the second floor exhibition gallery. Audio tours are part of the regular admission price at each house. Please note, during the winter months, guide-led tours may replace audio tours at some houses during some time periods. Please check the operating schedule to determine the type of tours in effect and the hours of operation for each house.